ARLINGTON, Va. (Dec. 15, 2008) -- Thousands showed up on a crisp Saturday morning here -- some from as far as Maine -- to lay wreaths at the headstones of those buried in Arlington National Cemetery. The event was the 17th annual "Wreaths Across America," where thousands of volunteers come out to ANC as well as more than 125 other cemeteries across the United States, to lay more than 100,000 wreaths at the bases of the headstones of American's war veterans. 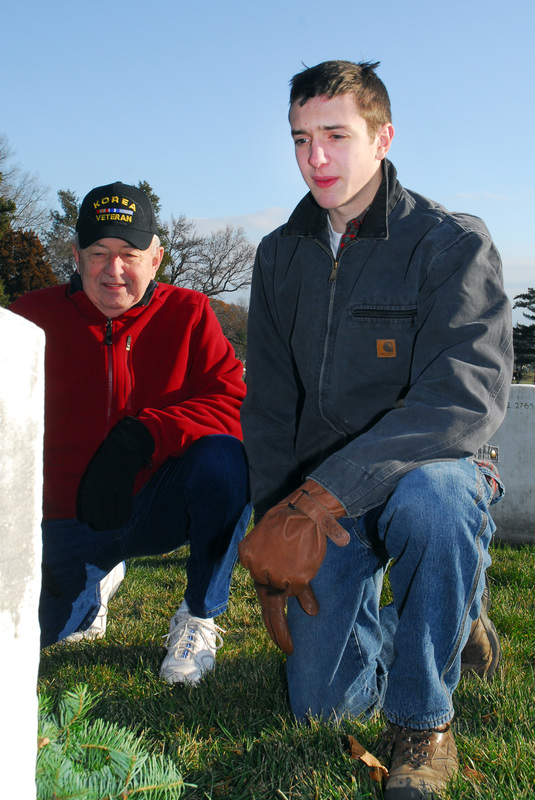 Josh Danis, an 11th grader from Portland, Maine, and his grandfather, Ralph Danis, of Arundel, Maine, lay a wreath at the base of a veteran's headstone in Arlington National Cemetery, Dec. 13, 2008. The elder Danis was a Korean War veteran with the 3rd Infantry Regiment, the Old Guard. Some 10,000 wreaths were laid in Section 12 of the cemetery as part of "Wreaths Across America," an annual event now in its 17th year. "It is because of these people that we have everything we have," said Karen Worcester, of the Worcester Wreath Company, in remarks that opened the event at ANC. "When all the wreaths are gone, walk by every one of them and then go by the section that didn't get the wreaths and say thank you and realize what an important part of our country this is. We are all here because we are all Americans, we love our country and we are so appreciative of what we have and why we have it." For 17 years, the Worcester Wreath Company -- Morrill Worcester and Laura Worcester -- has donated wreaths to the cemetery to decorate the white headstones of American veterans buried there. In 1992, the company donated just over 5,000 wreaths to the cemetery. This year the company donated more than 17,000 wreaths -- some going to other cemeteries, but as many as 10,000 that were designated for Arlington. And next year the company plans to send additional wreaths. "I'm very proud this thing has grown to where it is now," Morrill said. Afraid the large crowd of volunteers wouldn't feel as though they were able to do enough, due to the limited number of wreaths available -- he promised to deliver more wreaths to the cemetery the following year. "We are going to do another truckload of wreaths next year, so it'll be three loads," Morrill said. That amount comes to some 16,000 wreaths to be placed at Arlington. After words by Secretary of Veterans Affairs James B. Peake, and John C. Metzler Jr., the superintendent of Arlington National Cemetery, volunteers gathered at the back of two tractor trailer trucks to help unload the 10,000 wreaths and to place one at each of the headstones in Section 12 of the cemetery. According to Metzler, in that section of the cemetery are buried 10 Medal of Honor recipients, including five from World War II, three from the Korean War, one from the Civil War, and one from the Spanish-American War. Additionally, Michael Strank -- one of the six Marines photographed raising the American flag on Iwo Jima -- is also buried in section 12. Nathan Blevins, son of Air Force Senior Master Sgt. Robert Blevins, was one of the first to place a wreath on a headstone. He said why he agreed to come to the event on such a cold day. "To pray for the people that have died," he said, while laying a wreath at the foot of the stone. Josh Danis, an 11th grader from Portland, Maine, came to the cemetery with his grandfather, Ralph Danis, of Arundel, Maine, and a Korean War-era veteran who served with the 3rd Infantry Regiment, the Old Guard. "I came to lay the wreath, to look around some, and to see the changing of the guard," Josh said, explaining why he made the long road trip from Portland to Arlington. "He also just likes his grandpa," the older Danis said, putting his arm around him. The two laid a wreath together at a veteran's headstone.